For current opportunities to watch, make and produce film and to get creative at Watershed see watershed.co.uk/get-involved/opportunities/. You might also like to have a read of Watershed's Rife Magazine, which is a new magazine for young people, written by young people. Including film, music, art, culture, social issues and politics, Rife covers everything Bristol has to offer its young people. 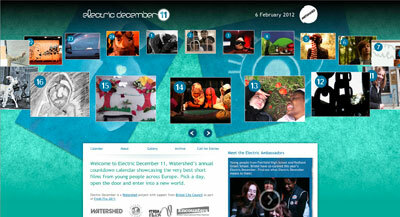 For past activities, events and opportunities for young people interested in film and media see Watershed Inspiration. Co-curated by Watershed's Future Producers, with entries from three continents, this was the widest reaching online showcase of young filmmaking talent since Electric December began. Again co-curated with young people from Bristol, you could find yourself with the Clairvoyant, Mystic Maggie, laughing with the staff of Hotel Talk To The Hand or meeting Italian cycling super hero Mailman. 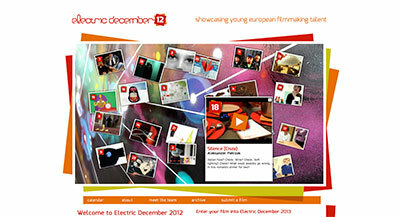 A delightful pick 'n' mix of 24 filmic goodies from across Europe, selected by young Bristolians. Including animation, drama, comedy, documentary, fable, and the downright surreal! Young people from across Bristol helped select 24 mini masterpieces from over 100 entries from 10 countries to bid farewell to the first decade of the 21st century. A group of young people from Bristol worked in partnership with young people from Vilnius, Lithuania to select a diverse range of films for you to unwrap throughout December. 2008's films were made and selected by young people in Bristol in partnership with young creatives from Spain, Germany, Poland, France, the Netherlands, Lithuania and other regions of the UK. 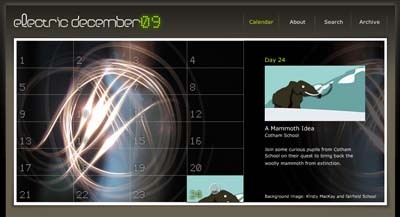 With more and more people generating great content for the web - particularly young people, Electric December 2007 showcased some of the freshest films and animations made by young people, from around the UK. With the theme of 'wishing' as inspiration Bristol-based schools, colleges, organizations, individuals and creative companies got together to create films, animations, games, and interactive pieces. 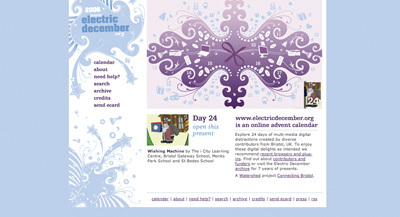 Artists, schools, colleges, media companies, arts organisations and community groups, interpreted a theme of Connecting Bristol. 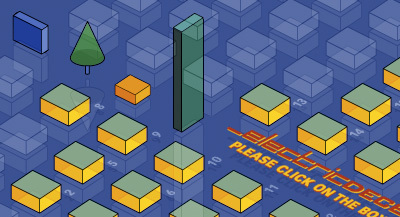 In 2004, the focus was on education and out of school groups, interpreting a theme of Transformation and again spanned the South West reflecting the digital creativity and talent resident in the region. 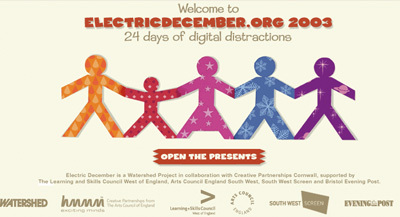 Creatives, schools, artists and groups from Cornwall & Plymouth joined with Bristol & Bath contributors to double the fun. 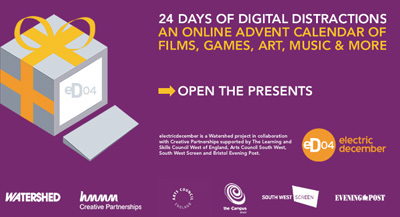 A varied mix of creative companies, schools and young people, community groups and artists, came together to produce 24 digital delights. 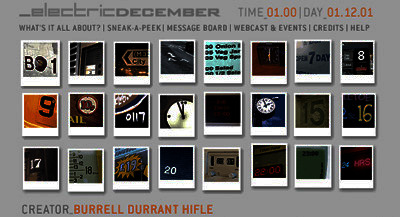 This year's contributors each interpreted life in the city at a particular hour of the clock. 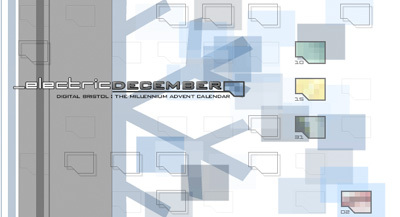 Over the 24 days a picture of city life gradually assembles as you travel from 0100hrs on Sat 01 Dec to midnight on Mon 24 Dec.
An advent calendar that looks to 2001 and imminent broadband networks, it looks forward creatively to the future and offers a taste of what is to come. 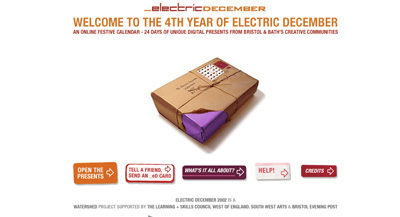 Electric December was launched in 1999 as a "31-day selection box of fun and festive 'virtual chocolates', produced to celebrate Bristol's creative energy at the start of a new millennium".